I am not sure if I am becoming a more efficient teacher, if my Portuguese is getting better, if Sal is the perfect Cob Building environment or I just got blessed with a Power Building posse of students in May…but this was the fastest 10km2 build yet! I arrived on a Friday afternoon in Sal airport and was met and whisked away with excitement by Paola Mariani in her white flatbed delivery truck! 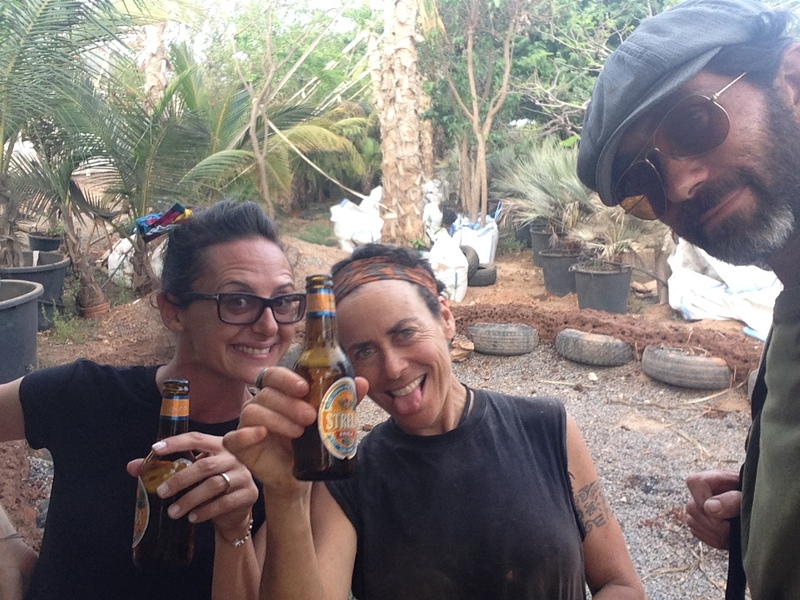 Paola, an Italian wild woman (Leo) and her husband Camilo, an Argentinian wilder man (Gemini) brought me to their giant nursery and abandoned animal park at the entrance of Santa Maria, the largest concentration of tourism in Cabo Verde. Their outfit is the only one of its kind on this dry desert landscape and an outpost of GREEN, humidity, shade and comfort on Sal. Locals and tourists alike come to enjoy a break from the heat and sun and pretend they are in the temperate zone of Europe, romping on the green lawn and picnicking under the variety of once-local tree species. All the vegetation is fed by reclaimed greywater from the endless resorts on the island and rows of dried poop from the septic tanks lines the hectares of unused land around them. Grateful to collaborate with such a vibrant and effective young couple, I got to work immediately on Friday afternoon as we brainstormed the easiest and cheapest foundation materials. Used tires!!! Yes!!! And Paola sent Boris, their man-of-all-trades manager, off to collect tires everywhere! 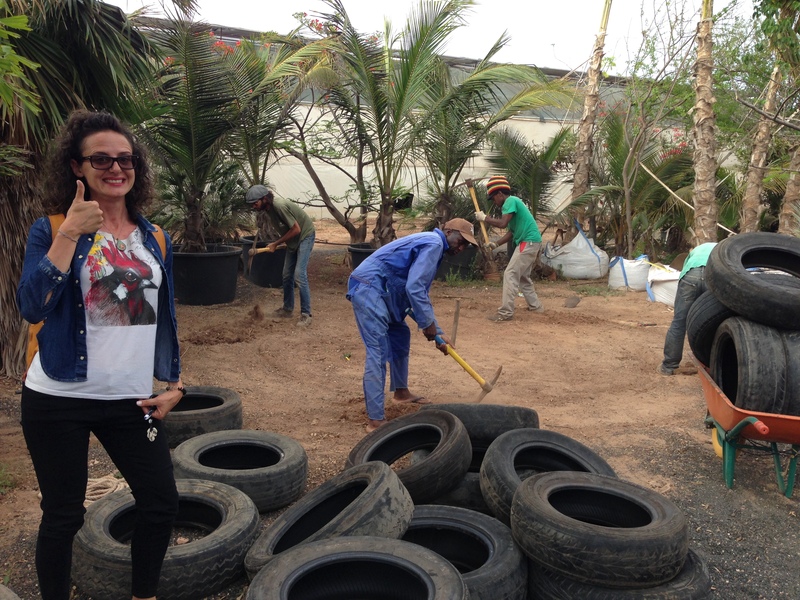 Within an hour he was back with the 50 tires we needed to build our two-level foundation for a 10km2 structure right at the entrance to the tour of Viveiro Cabo Verde! 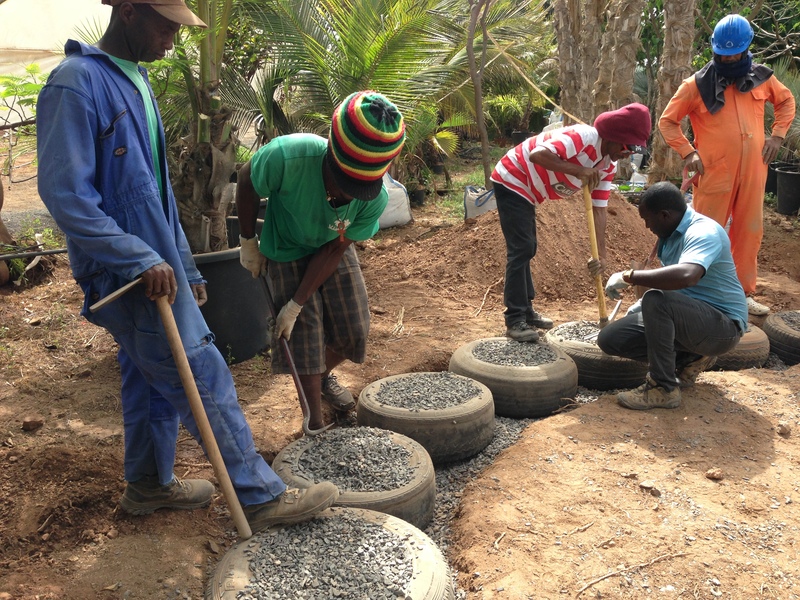 Within a few hours we had dug the trench, poured in gravel and lay the first row of tires densely packed with gravel with only half the builders (4). We had 7 days to get to the roof. Visitors were already showin’up to check things out after Paola’s Facebook launch only a few days before we started. 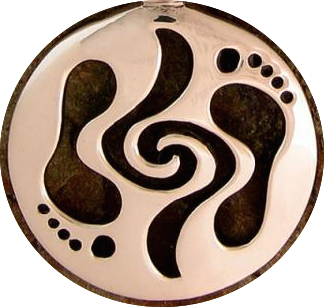 What followed was one of the most exciting worksites I have had the fortune to lead in all my experience. 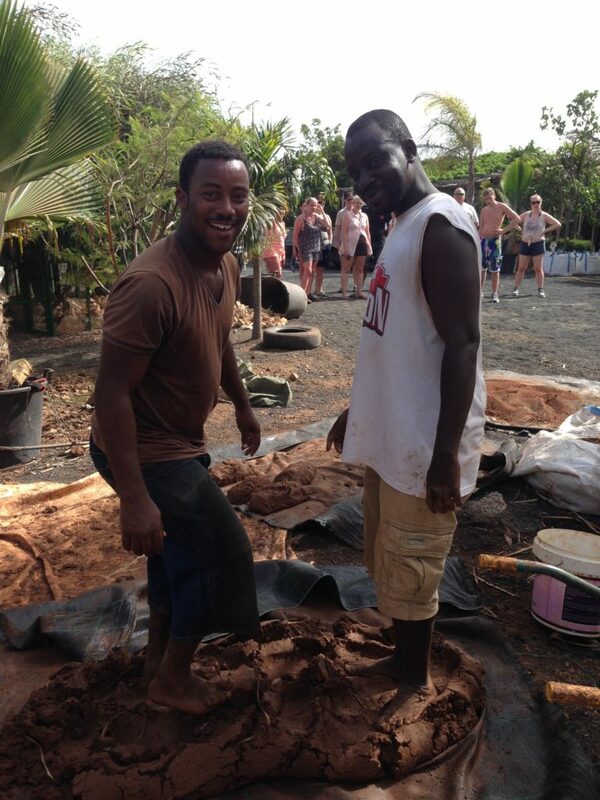 Sal has clay soil everywhere, mostly red, and mostly free, or so it seems. It does require an addition of “rough sand” to make it perfect, which we found in the riverbed, free too. The only momentary challenge was the “straw”, which we created out of palm frond leaves separated a couple of times to reach the ideal width by a happy group of women who enjoyed the talk/work setup while the guys were sweating away. I like to have men and women working on the site but in this case, with a time crunch, it was useful to have some active muscle at work bringing materials, making cob, building, throwing, etc. My 7-8 Cabo Verdian mixed student body, as usual, did not know what was coming. Some were from other islands, some had a building background, others specialized in landscaping and plants and we had one soccer player/bartender and one musician. 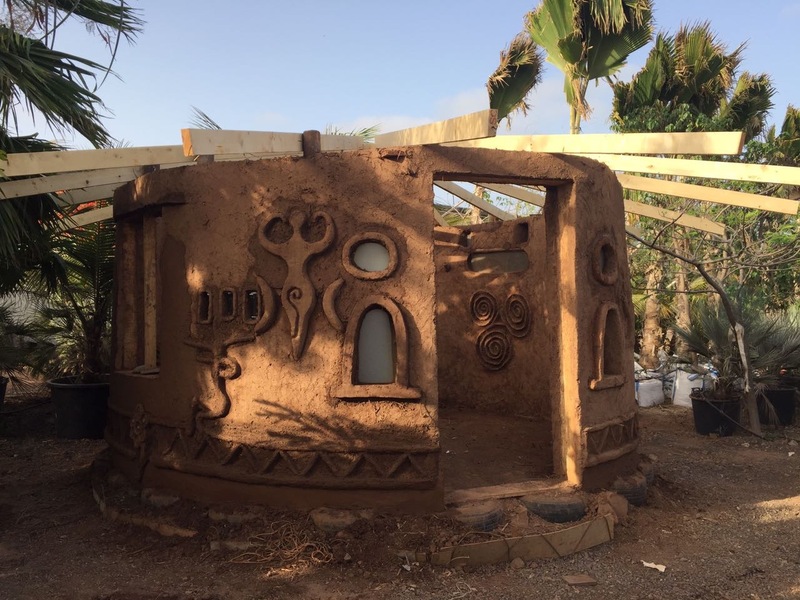 In 7 days they all became experienced cob builders and their eyes grew wide as did their smiles as they saw the red, personally sculpted “casinha” bungalow grow taller and more beautiful under their hands each day. 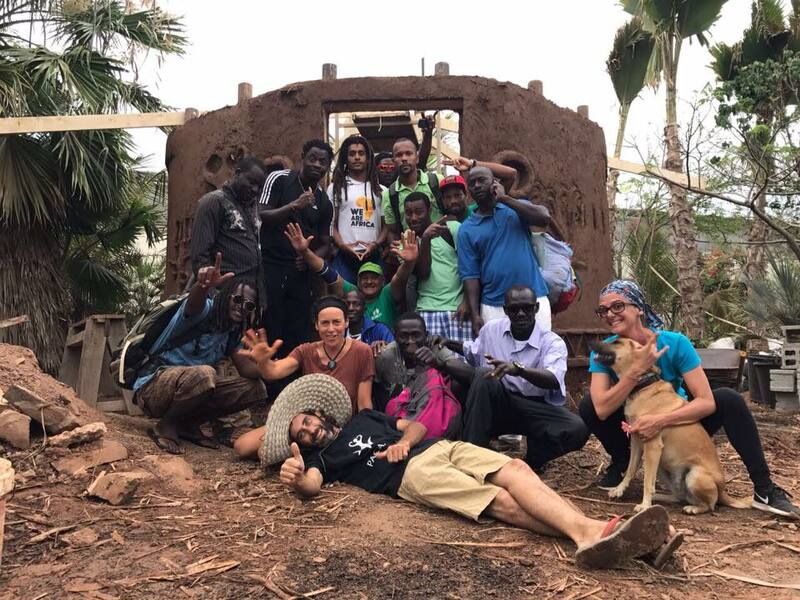 At the end of their 8-hours, they would all stand back and look at what they had accomplished that day and their self-confidence and empowerment grew as they realized the unexpected gift they had been given in these 7 days: the skills and knowledge to build themselves a beautiful, solid, organic home for free! A real house that worked and would stand out from all the others! 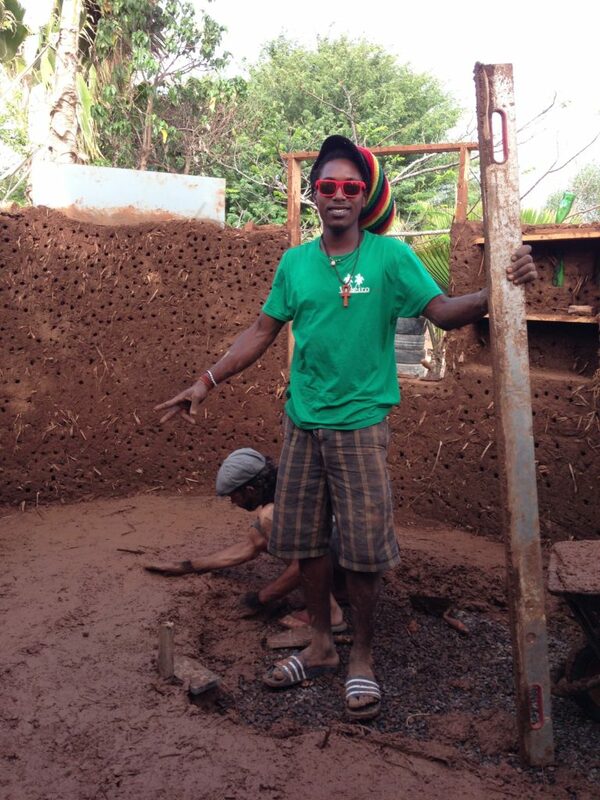 No cement, no blocks, no rebar and little or no money! With trade they could gather all they needed and afford a home soon! The glee and passion I witness in my students all over the world as they accomplish and complete a structure is my gift to myself. I know it will then go out and replicate bringing Joy and Happiness to more people, feed their Souls, expand their Consciousness and Images of what is possible on the Planet. Most important of all for me is that I am benefitting the health of the Earth, my Mother, our Mother, who sits under us humbly gifting food, building materials, water, Beauty, comfort and Love. I know I am doing well by Her and that is my Peace.